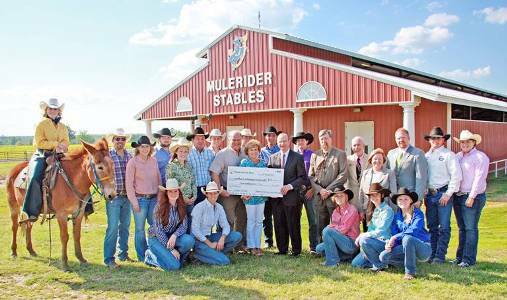 Dr. David Rankin, center right, accepts a check for $2 million from Therral and Jan Story of Magnolia while the SAU rodeo team and other administrators look on. MAGNOLIA – Construction of a new rodeo arena at Southern Arkansas University is much closer to reality after a $2 million donation from Therral and Jan Story of Magnolia. The gift, made through the SAU Foundation, is the largest ever received by the University from an individual donor. The Storys presented a check to the SAU rodeo team and administrators on Wednesday, April 14. Therral Story said he appreciates the hard work demonstrated by the students on the rodeo team and is impressed by the fact the team is composed of students from across the nation. He hopes a new arena will only expand the team’s successes and bring more events to Magnolia. As part of the University’s Blue and Gold Vision master plan, the proposed covered arena will be designed to meet the needs of SAU’s intercollegiate rodeo team. The facility will also be built to accommodate horse shows and other livestock events as well as concerts and trade shows. Feasibility studies are being conducted to determine the best location for the arena in the vicinity of the existing Mulerider Stables. SAU President Dr. David Rankin said the arena will provide an excellent location for members of the nationally competitive SAU rodeo team to practice rain or shine. It will also help draw more visitors to the campus and Magnolia. SAU Rodeo Coach Rusty Hayes said the new arena will give the University a competitive edge. SAU has hosted high school rodeos in the past, but they have been held out of town due to the lack of facilities. The new arena will allow more collegiate and high school rodeos to be held on the SAU campus, and those rodeos will bring more prospective students. While plans for the arena have not been finalized, University officials estimate its total cost will be $3.5 million and that it will be approximately 125,000 square feet covered. Parking will add an additional 12 acres to the site plan. 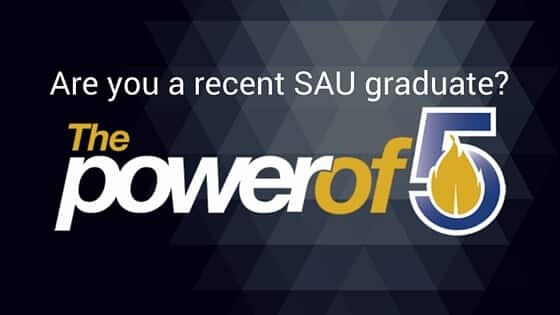 The SAU Foundation will continue to raise private funds for the arena’s construction.